While the shocking arrest in May of IMF managing director Dominique Strauss-Kahn in connection with an alleged sexual assault dominated the news all over the world, it only complicated a plot that was already more intricate than a summer blockbuster. One of the most high-profile cross-border chair dances seen in decades was already in full swing at the IMF, and the recent developments are likely to change only some of the dynamics. 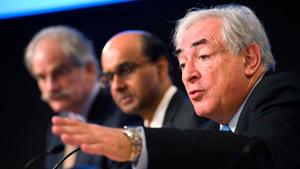 Strauss-Kahn had previously hinted he would not seek a second term at the IMF in order to stand as the socialist candidate in the French presidential elections next spring. And, just a few days before Strauss-Kahn’s arrest, it became clear that the current No. 2 at the IMF, John Lipsky, will leave his post in August. With both the top spots coming open, now may be the moment when emerging-market economies are finally able to upend the longstanding tradition that sees an American as deputy to a European IMF top official. At least one thing seems certain: The new head of the IMF will not be Mario Draghi, the highly respected governor of the Bank of Italy and head of the G20’s Financial Stability Board, who until recently was the leading candidate. Draghi is now poised to succeed Jean-Claude Trichet as president of the European Central Bank. His appointment to the ECB would create two extra job openings for senior European technocrats: one at the FSB, and a second on the ECB board, where economist Bini Smaghi will probably step aside in favor of a French official in order to mend the imbalance of having two Italians in the bank’s leadership. In the final tally, France will likely gain a ECB executive, but it will still lose an IMF director.